Hi Crafty friends, apologies I have been MIA for a short while. Life gets in the way sometimes, I have been really busy spring cleaning (inside & outside! ), De-cluttering, donating lots of goodies to local charities. I have 2 lovely techniques to share with you today. I made an Easel Card project and will show you my fun, scrap saving technique for applying the additional Inlay/Overlay colour to your projects, just like the Poppy Card in my previous post. Also I will show you how to make the Spellbinders – Nestabilities/Resplendent Rectangles into a square. I made the Fleur De Lis Square frame next and applied my Inlay/Overlay technique, I then coloured it with Distress Inks. You can view my Inlay/Overlay technique tutorial Here. I made a square frame to set behind the Fleur De Lis panel, using Spellbinders – Nestabilites/Replendent Rectangles. 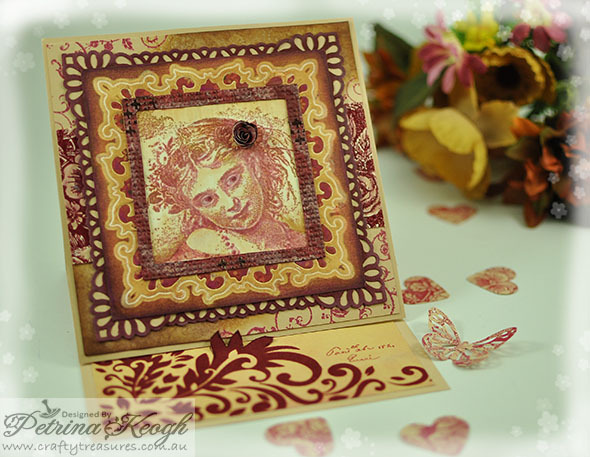 You can view my Resplendently Square tutorial Here. I made the easel stop with a gorgeous flocked print from Kaisercraft – 6″ x 6″ Paper Pad/Gypsy Sisters Collection, but backed a small portion behind the flourish with some cardstock to add strength, so I could cut part of the design to make a stronger easel stop. I also made a small frame for the Fleur De Lis panel, I embossed the frame with Stampin’ Up! 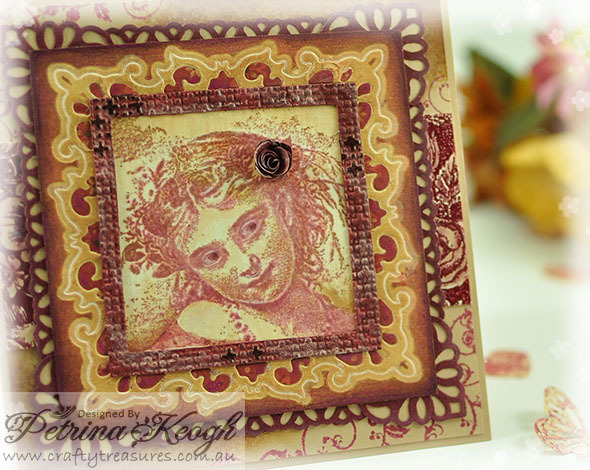 – Embossing folder/Square Lattice, I just didn’t like the bare frame. 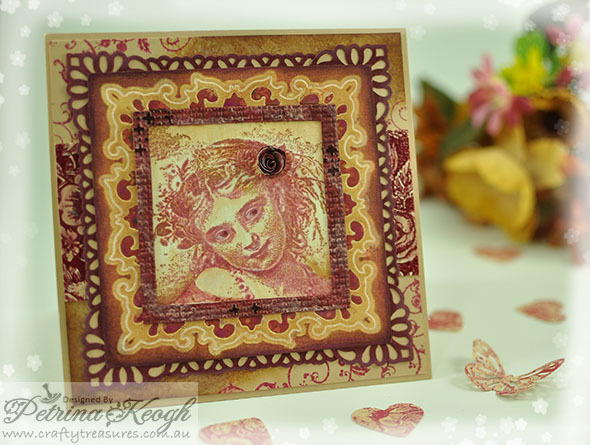 I also had some MFT – Die-namics/Mini Rolled Roses already cut so I coloured this one with matching Maroon Acrylic paint and highlighted it with a lighter shade.